Our third joint worship experience with Quinn Chapel A.M.E. was held this past Sunday, July 29th. Early in 2017, we enjoyed sharing breakfast, Sunday school, and worship with them in their church and sanctuary. This same combination of breakfast, Sunday school, and worship was then held at our location earlier this year. These wonderful and meaningful exchanges prepared the way for our summer picnic and worship. 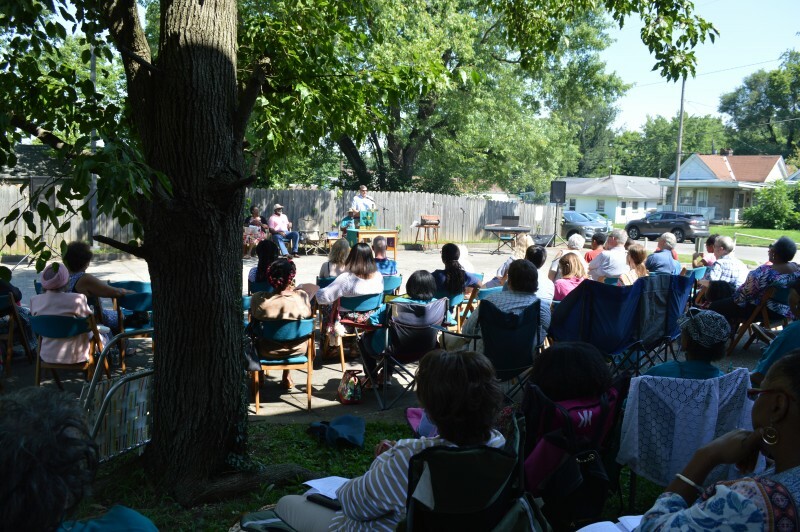 Joining an annual event Quinn has sponsored for the Charles Avenue neighborhood with an outdoor worship service and picnic on their church grounds, around 75 members and friends of Central Baptist Church were glad to offer our support and attendance. The weather was perfect. The food was delicious and abundant. And the spirit of love and mutual support overwhelming. It was a heart-warming and spirit-lifting event. Additionally, $ 525 was raised to help another A.M.E. church in Danville suffering from spring flooding. The worship service closed with Quinn welcoming a new adult candidate for baptism. Rev. Golphin shared these encouraging words in an early Monday morning text, "Thanks again for yesterday! Several neighbors told me they either sat on their porches or simply opened their windows to enjoy the service and would be definitely visiting Quinn in the future! It was indeed a highlight of brothers and sisters in Christ joining together in the common work of ministry. We look forward to what God has in store for us as we continue this journey with our friends at Quinn. As a Baptist church affirming the liberty of conscience, we recognize each individual's right to his or her own opinion and welcome your comments, positive or negative. We strive for communication that invites a respectful and personal exchange of opinions and thoughts. This is often not possible through running dialogues in our comment section. To respect the dignity of all persons, we may delete comments that contain profanity, hate speech, or threatening language.